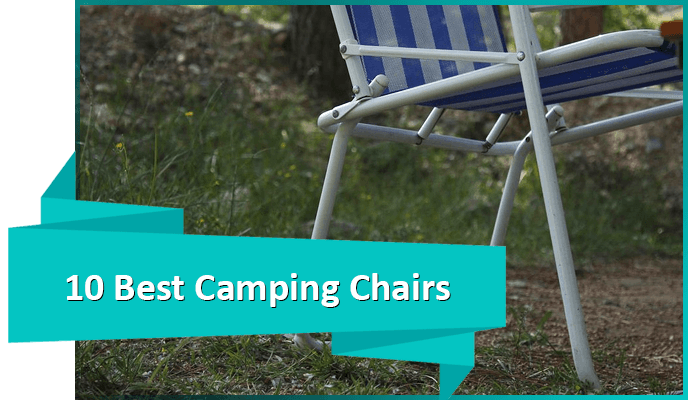 Your camping trip can be so much more fun with a comfortable mattress where you can pass the night away. 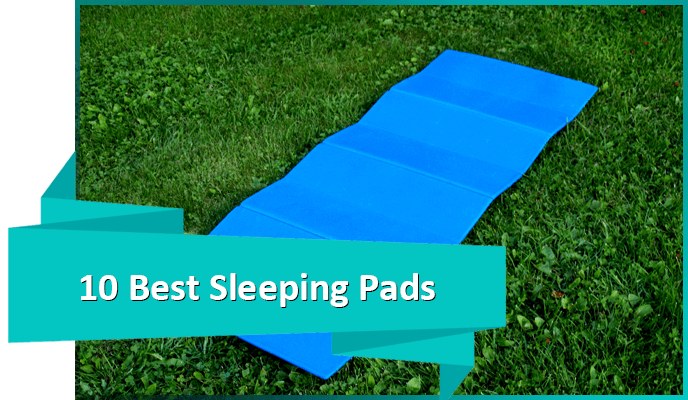 If you are looking for the best air mattress for camping, you can find just the help you need right here. In this list, you will find reviews on ten of the best products, a comparison chart of the top five products, and more. We have chosen the best and most comfortable products in order to make your nights easier and more exciting. 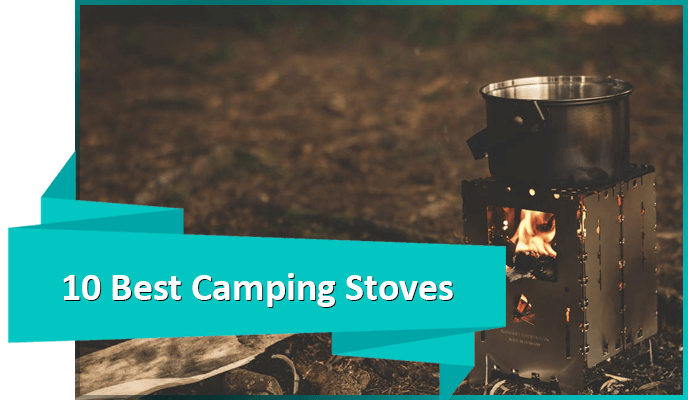 In the comparison chart below, you will find the top five best air mattresses for camping and a bit of background information about each one. You can use this chart to compare products when choosing the best one to fit your needs. We start off our best air mattress for camping list with this amazing mattress that comes both in a Queen size and a Twin size, so you can choose the best size to fit your needs. This air mattress also comes with a pump system that is both quiet and ensures that your mattresses never goes flat, until you are ready of course. With a coil system, this bed has a level sleeping surface that is comfortable and works to keep your sheets on the bed and not bunched up. 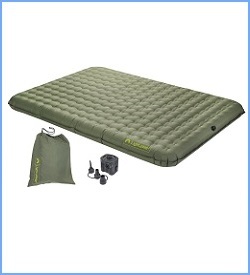 The materials used to make this air mattress are both puncture proof and waterproof, which makes it ideal for camping outdoors in a tent or on the open ground. The mattress has a raised height which makes it easy to get in and out of bed. 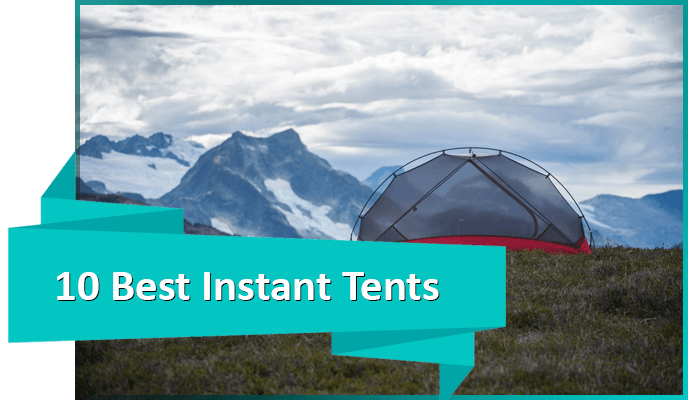 You can also check out our recommendations for the best instant tents. For single adults, this air mattress is a perfect size. The top is soft flocked for a comfortable sleeping space, and the mattress is ideal for outdoor or indoor use. It can even hold up to 300 pounds of weight. This mattress even folds away for easy storage when not in use. The air pump is a hand-held pump that runs on six “C” cell batteries. Though this might seem like a lot, the pump does a great job of pumping up the mattress for a great sleeping surface. The batteries for the pump are not included with the purchase of the mattress. This Queen size mattress is super soft, making it ideal for a good night’s rest despite being outdoors and on the hard ground. Two adults can fit comfortably on this mattress, which is great for camping together. This mattress is also raised to make it more comfortable when getting in and out of bed. The construction sports a Dura-Beam idea that provides maximum durability and support when sleeping. Another interesting feature of this mattress is the built-in pump that is electric and allows you to blow up the mattress anywhere at any time. 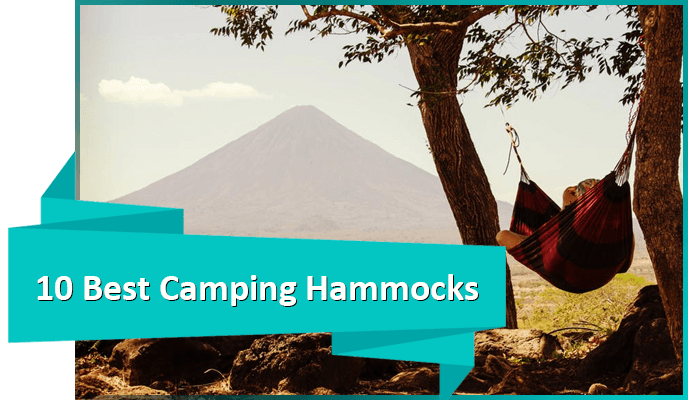 Also, if you love camping, you might also like to get a camping hammock. The next addition to our best air mattress for camping list is this waterproof air mattress great for kids who love to go camping. The mattress is made with a flocked top for comfort and for keeping the sheets locked firmly in place. 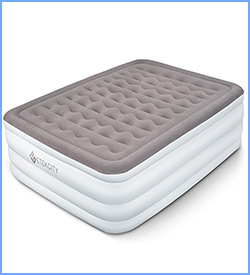 Though the mattress doesn’t come with a pump, you can find them easily for this mattress. Kids will love sleeping on these brightly colored mattresses, and they even come with an inflatable pillow with matching flocking for comfort and fun. However, these mattresses are not intended for children under 15 months old. This airbed comes with a built-in pump for easy inflation no matter when or where you are. The mattress is also waterproof with a flocked top for comfort. With a doubled up layer of wave beam, this construction is durable. The mattress is raised off the floor making it easy for you to get in and out of bed, and if even fits standard sheet sizes. The mattress inflates and deflates easily as well. 300 pounds of weight can be held on this mattress, and the pillow addition is great for resting the head. 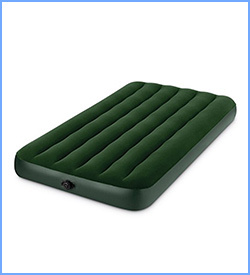 This air mattress is ideal for both indoor and outdoor use, making it a great option for camping trips. 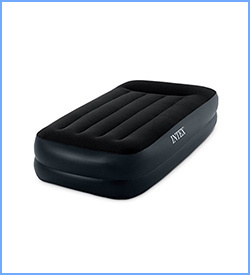 This is why this airbed has made it to our best air mattress for camping list. The extra-wide opening of the pump makes it easy to inflate and deflate. 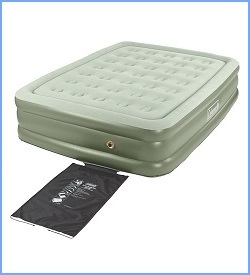 The pump is not included with this air mattress, but it works with most standard mattress air pumps. The size of the mattress even fits standard sheets, and the flocked top helps hold the sheets on the mattress. 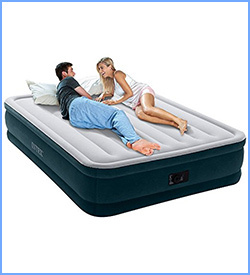 When you are under the stars with some company it is crucial to have the best air mattress for camping. The waterproof material is flocked for comfort, and the indented sides keep your fitted sheets securely on the mattress. It inflates quickly and comes with a duffle bag for quick storage when not in use. The mattress comes with a built-in pump to make inflation and deflation easy and quick. If you are looking for a great mattress for two large adults, then you’ve found the best one for your camping trip. For an eco-friendly option, this product is the best air mattress for camping when it comes to going green. The construction is a double layer idea that is puncture resistant and waterproof. The built-in pump is great for quick inflation, and the storage compartments are great for storing away cords for a clutter free room. The airbed sits at 22 inches tall, which is ideal for those who might need help getting in and out of bed in the morning and at night. The Queen size fits standard sheets, and the indented sides will hold onto your fitted sheets to reduce bunching. 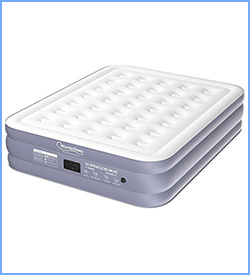 Next on our best air mattress for camping list is this extra cushioned mattress from Coleman that has a dreamy soft plush top. Moreover, the extra-high design makes getting in and out of bed much easier, also the ComfortStrong coil system provides better support for all-night comfort. It fits standard queen-sized sheets and supports up to 600 lbs. 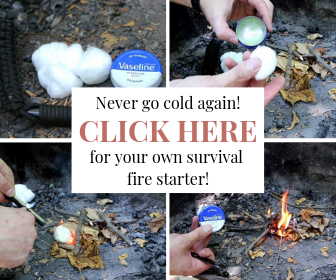 It is meant for both indoor and outdoor use, so it is great for camping. However, the pump needed to inflate it is sold separately. 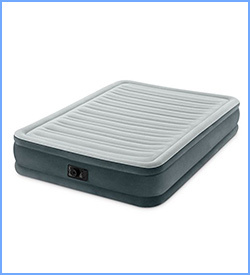 This air bed mattress is made from a PVC-Free TPU (Thermoplastic polyurethane) material that offers superior durability. 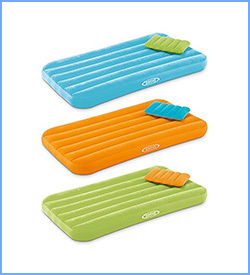 It is also abrasion resistant, more temperature stable and more durable than PVC air beds. Moreover, you can adjust its firmness with the help of the two-way Boston valve and patented stabilizer system. This mattress comes with a battery operated pump for which the batteries are not included, and for storage, you can use the oversized storage bag it comes with. Also, it fits standard queen sheets, weighing about 6 pounds. 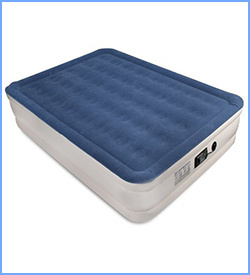 This ComfortCoil technologically advanced air mattress is a great product to purchase as it contains 40 different coils to provide durability and support during the night, which is great for someone who might suffer from aches and pains. The mattress inflates quickly, and the Queen size is spacious. The height of the bed is great for someone who might struggle when getting in and out of bed, and the bottom is made with a sure grip that keeps the mattress from slipping on hard surfaces. 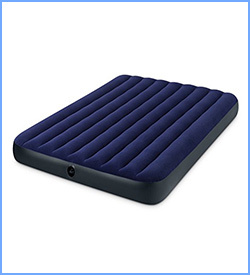 When you are looking for the best air mattress for camping you will understand why this product made our number one. This Queen sized mattress is spacious and easy to inflate. 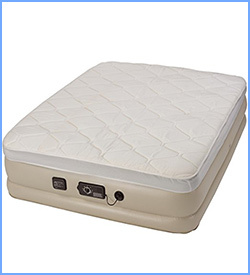 It is comfortable with several air coils within the mattress, to provide support and durability. Waterproof and flocked for comfort, this mattress is great for camping trips or even just indoor, home use. This mattress is also puncture resistant, and the reinforced bottom is ideal for keeping the mattress in place even on the most slippery of surfaces. 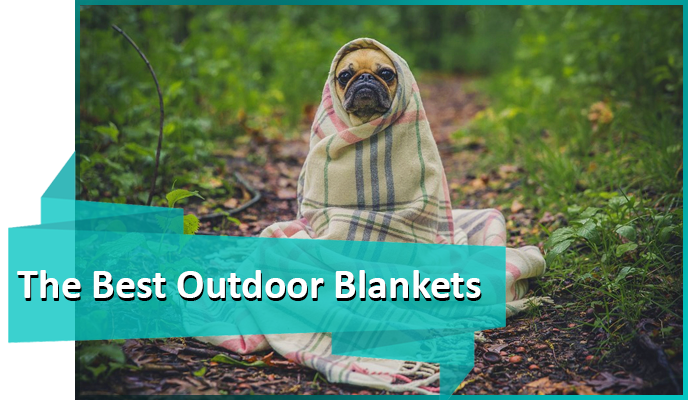 Sleeping on the hard ground during your camping trip is not ideal, that’s why we have given you a reviews list to help you choose the best air mattress for camping to make your trip amazing. 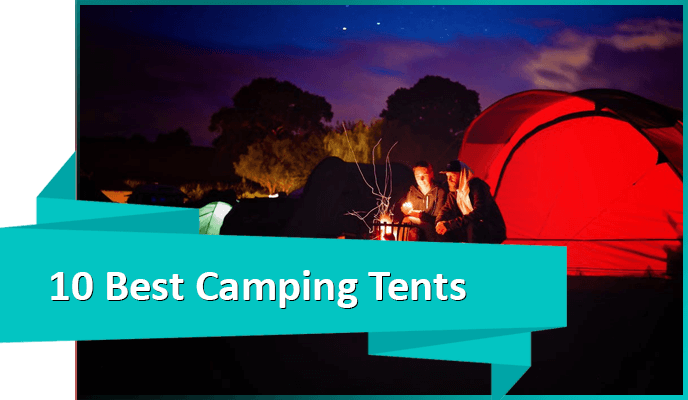 When getting a camping mattress you must always get the best camping tent available as well. Please feel free to let us know if you tried any other mattresses that did not make our list, and leave us a comment below!